My Beatport DJ chart July 2014 is available! Some tunes are included in my Soundcloud Mix July 2014 aswell! My Soundcloud Mix July 2014 (Dark Special) is available! My Soundcloud Mix Series is back with a Dark Special Mix. This time I’ve mixed 18 darkish tunes into just one hour! The mix features tunes and remixes by artists like Royal Flush, Indecent Noise, Alex M.O.R.P.H., Luke Terry, Binary Finary and many many more! Stream+Download enabled, enjoy! Tic Tac Trance #079: Replay Available! 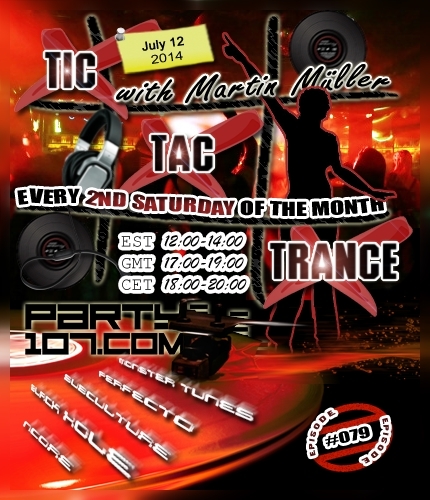 Tic Tac Trance returns on July 12 2014 with episode #079 on Party107.com. You can expect for this show a 2 hours uplifting & psychedelic underground trance mix which features tunes of labels like Ncore, Black Hole, Subculture, Perfecto, Monster Tunes and many many more! Make sure to tune in!